I made this for my mother for Christmas, but it would also make a great Mother's Day gift. Or Father's Day. My grandmother passed away last year, not long after Mother's Day. She and my grandfather had a rocky marriage, particularly in later years. So when we came across a picture of them that reminded us of the fun they could have together, it was a precious thing! As soon as I saw the picture, I knew I wanted to showcase it in some way. I decided to frame it and give it to my mother for Christmas. My mother absolutely LOVED it. She took it to our big family gathering to show everyone, and they loved it, too. It was a gift she will always cherish. I wanted to give my father something similar. A few weeks before he had emailed me a picture of his parents when they were young - one of his cousins had unearthed it. I had it printed in sepia, and made 5 x 7 size. I bought an 8 x 10 frame for it. I covered the backing board in a piece of textured scrapbook paper that I thought went with the picture and frame perfectly. Once again I used the clear "family" stickers. Used another of the Hobby Lobby flowers. He loved his gift, also. 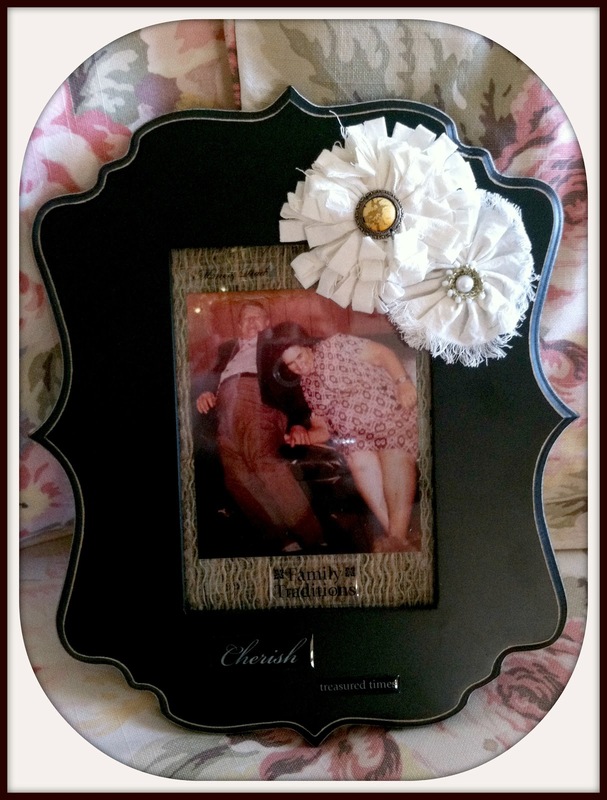 I loved the way the ornate frame made the simple picture stand out. So very easy to do, but big, big hits as gifts.